In skillet, melt butter over medium heat. 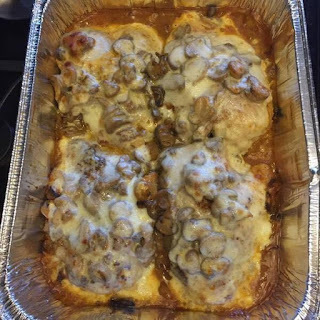 Brown both sides of chicken in skillet. Place chicken in pan, arrange onions and mushrooms on chicken, and top with mozzarella cheese. Add chicken broth and cream of mushroom soup together and stir til blended then pour over top of mushroom, onion and chicken..